This was a retrograde step for locals using public transport so, 100 years ago, on April 5 1919, the Galway General Omnibus Company was registered as a public company. 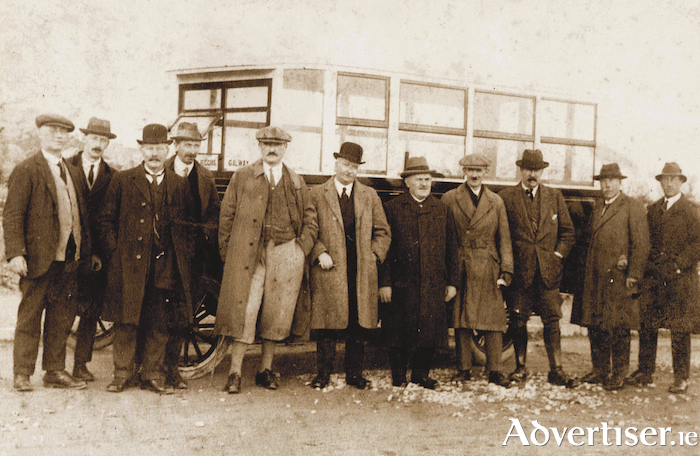 It was the first motor omnibus company to be founded in Ireland and it held its first meeting on July 31 that year. The stated objective was to operate a bus service every 15 minutes between Galway and Salthill. During its first year the company, also known as Bus Comhlucht na Gaillimhe Teoranta, made a net profit of £634. The rolling stock comprised three vehicles including a double decker Commer bus with seating for 48 people, an open top Karrier double decker with 49 seats, and a single decker for winter service to Salthill. The body work on the buses was built by Fahy Brothers, who were well known coach builders in Forster Street. The manager of the company from 1920 to 1924, when he emigrated, was Michael Joyce, the father of William Joyce who became famous during WWII as ‘Lord Haw Haw’. In 1921, two of their buses were commandeered by the Auxiliaries and driven away with machine guns mounted on board and never seen in Galway again. In July of that year, two more buses were commandeered for the purposes of removing patients from Galway Workhouse to permit occupancy of the building by the military. Seventeen men and 43 women were forcibly removed amid protestations and these aged and infirm people were taken, in great distress, to Gort Workhouse. The company continued to grow and expand with new routes but in spite of the fact that it was in good financial state and making a profit, and also in spite of many local objections, it was taken over by Great Southern Railways in August 1936. Our photograph show some of the directors and staff in front of one of the early vehicles (probably a Lancia ) c1920. They are, from left: WP Higgins, J Winter, MT Donnellan, JM Leech (company secretary ), TC McDonough, MJ Joyce (manager ), MJ Crowley, J O’Kelly, Mr Lynch, Paschal Joyce, Joe Young, and a man named Guilfoyle. Much of today’s information is taken from Michael J Hurley’s book The Story of Galway General Omnibus Company Limited.